A growing appreciation for the environment is having a major impact on the oil and gas industry. While finding and extracting oil and gas from the ground remains paramount, companies – in some cases prodded by environmental groups and government agencies – are increasingly focusing on reducing their carbon footprint. According to The American Petroleum Institute (API), a single gallon of improperly disposed used oil can contaminate one million gallons of drinking water. Waste oil is a natural byproduct of the combustion engines that power engine oil rigs, and can be recycled and re-refined for use as heating oil, asphalt or heavy lubricant. But even after being recycled and re-refined the used oil still contains heavy metals and other contaminants. Of course, the challenges of drilling for oil and gas in remote locations – where temperatures and atmospheric conditions can vary wildly – can be daunting even without the need to keep in mind environmental requirements. In order to maximize efficiency, rig operators need to reduce downtime due to breakdowns so the machines can be kept running. Any kind of mechanical difficulty can quickly turn profits to losses as a result of lost productivity, costs of personnel and materials. Oil and gas industry veterans can be forgiven for assuming that placing a greater emphasis on environmental impact will lead to higher costs and shrinking profit margins. However, they may be surprised to learn that going green can be so cost-effective that it can pay for itself in a matter of weeks and even add to the bottom line through reduced maintenance. One way to keep environmentalists and shareholders happy and in agreement is by anticipating problems before they happen. Over the past decades, maintenance has evolved from reactive – fixing something when it breaks – to preventive, which utilizes a scheduled maintenance program. The cutting edge of these programs is condition-based maintenance, or CBM, which seeks to anticipate the needs of the equipment and extend equipment life. CBM uses technology such as oil analysis to determine when maintenance is required, which means maintenance is performed only when needed, significantly reducing maintenance costs. CBM allows for safe extension of oil drains, and operators are alerted to potential problems before becoming a critical issue that could necessitate drilling downtime. There are several elements to CBM, but one major oil and gas driller, with operations throughout the world, emphasizes the use of bypass engine oil filtration and oil analysis. In bypass oil filtration, lubricating oil is slowly siphoned out of the engine, then cleaned of solid, liquid, and gaseous contaminants and the appropriate amount of base additives replenished to maintain viscosity and the oil chemical balance. This keeps lubricating oil free of contaminants and able to cool, lubricate, and seal the engine. 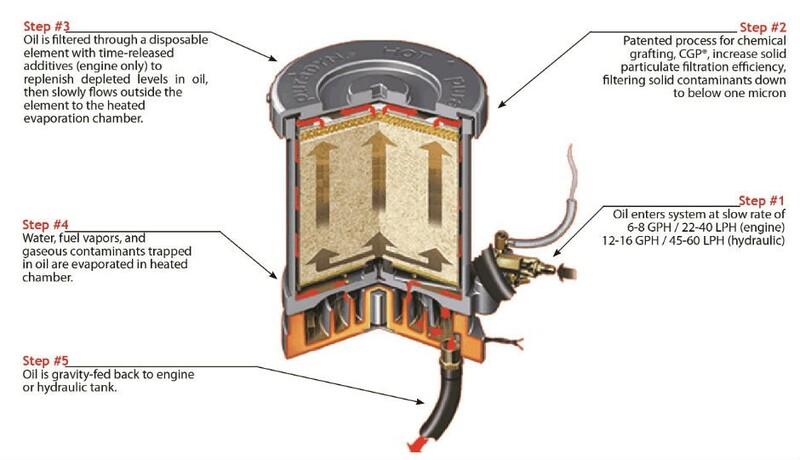 The clean oil is then gravity-fed back into the engine oil sump, and at the scheduled oil service interval, an oil sample is taken and the disposable filter element replaced. Importantly, these actions can be performed while the engine is running and take only a matter of minutes. Once a successful bypass filtration program is implemented, most companies find that indirect savings from the program, such as reduced oil handling logistics, downtime, reduced component repairs and extension of life to overhaul, significantly outperform the direct savings from the safe extension of oil life. Oil analysis provides instantaneous and continuous monitoring of the oil’s condition, including viscosity and amount of abrasive solids, which are indicators of the engine’s overall health. If the sample shows the oil to be in good condition, it can remain and does not have to be changed. In fact, by keeping the oil continuously clean of contaminants and base additives intact, oil can be used almost indefinitely. A common filtration system in use is Puradyn Filter Technologies’ TF-240 model, which provides microfiltration for engines with an oil capacity of up to 85 gallons (322 litres) and can be used in multiples, providing fine-filtering for engines that hold 500+ gallons (1,890 litres) of lubricating oil. In a test, one international drilling client safely extended oil drain intervals from 500 hours to 2,500 hours. In addition to bypass oil engine filtration and oil analysis, some companies have now included an onboard oil condition sensor that enables engineers to monitor oil condition in real time, all the time, while the engine is operating. By instituting these programs, companies are seeing millions of dollars in annual savings in addition to reducing their carbon footprint. A large driller that uses the CBM tools of bypass oil filtration and oil analysis estimates that the annual savings in new oil purchases and waste oil disposal is more than $5 million (US). This translates to an annual reduction of more than 370,000 gallons of engine lubricating oil. In addition, personnel requirements for oil drain maintenance are reduced by as much as 5,500 hours. by Kevin Kroger President and COO of Puradyn Filter Technologies.